In the early decades of the 10th century the mortal remains of the martyred East Anglian King Edmund were brought to the Anglo-Saxon settlement of Beodricsworth. This was the single most significant event ever to happen in the history of the settlement which was to become Bury St Edmunds, a town which was to go on to experience a long history of significant events. As a direct result of its holding the royal relics, during the medieval period the emergent Abbey of St Edmund grew to be one of the wealthiest and most powerful monasteries in England, and became one of the major pilgrimage sites in western Europe. In the 500 years since the Dissolution, the site has enjoyed a rich and varied ‘afterlife’, which has seen the area develop and adapt with the changing needs and fortunes of individual landowners and the wider town. 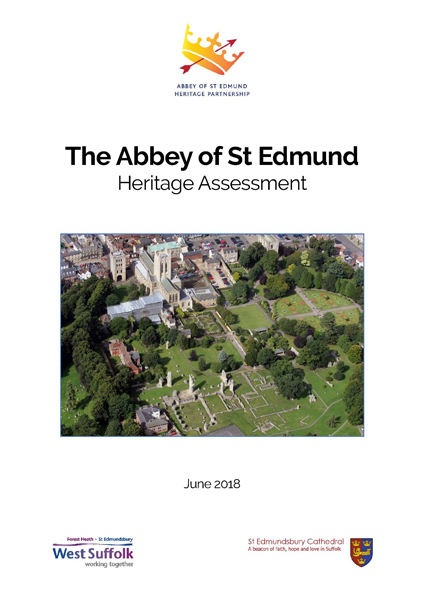 This report focusses on the heritage of the former monastic precinct of the Abbey of St Edmund, with a specific emphasis on its historic environment and the heritage assets which are to be found within it. For the first time, this report collates and assesses all of the available historical and archaeological information, characterises the known and potential archaeological and built heritage resource, and reviews the history of the site from the earliest times to the present day. This project was commissioned by St Edmundsbury Borough Council and funded by St Edmundsbury Council and Historic England. The Heritage Assessment process was managed by the Abbey of St Edmund Heritage Partnership.